Montessori elements are designed to feed the natural curiosity of children and to help them grow in their love of learning. Children need and want to engage in purposeful activity, imitating the adults around them. To facilitate this, practical life materials allow children to immerse themselves in tasks which include pouring, scrubbing, folding, using tweezers, tongs and eyedroppers, scooping, polishing, and managing buttons, buckles, laces, zippers, hooks and eyes, and snaps. Through a particular sequence of actions, from set-up to clean-up, children learn to pay attention to detail and to employ good work habits. This also helps develop their coordination and increase their concentration span. Sensorial materials are designed to engage children’s powers of observation. By manipulating a specific assortment of objects, children’s senses are sharpened. The objects (i.e., color tablets, sound cylinders, baric tablets, etc.) employ contrasts in color, sound, weight, smell, texture, size, and shape. Each set of items isolates one defining quality, requiring the children to distinguish and categorize the information. This develops the ability to understand what they perceive and to apply new understanding to already-obtained information… the beginning of conscious knowledge. During these critical years of development, children’s desire to become competent and capable is characterized by spontaneous interest in the things around them. Children have an instinctive tendency to touch and investigate items, which is served by the hands-on nature of the Montessori classroom. 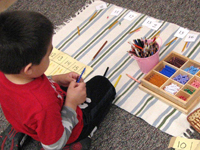 Because abstract concepts are easier to grasp when introduced in ways that can be manipulated, Montessori materials are utilized in all areas of learning. This allows children to absorb, apply and retain principles which provide them with foundations for future learning. The Montessori classroom contains both traditional learning resources as well as a wide variety of materials designed to advance abstract thinking. Students use Metal Insets and Sandpaper Letters to develop intellectual knowledge of letters as well as the muscular ability to write. The Moveable Alphabet and Nomenclature Cards connect the written and spoken word. Spindle Boxes, the Thousand Chain and Test-Tube Division facilitate enthusiasm for learning basic mathematical operations, while Fraction Skittles and the Pythagoras Board reinforce concepts in higher calculations. Command cards and Grammar Boxes promote proper sentence structure and use of nouns, verbs and adjectives. Land/Water Formations and Puzzle Maps introduce children to the natural features of countries, continents and the Earth. Timelines are used to illustrate the progression of history, civilization and world events. Classification Cards present information on a wide variety of species, and help students understand the 3 domains and 6 kingdoms of biology. Because Montessori materials are designed to complement the natural learning process, students are captivated and engaged in the classroom. This results in a rich educational experience and creates an excellent groundwork for future academics.